The Catalan architect Antonio Gaudi was equally admired and ridiculed for his, some might say, obsessive and eccentric practices. Ultimately his unique vision, nourished by a generous patron, won the hearts of the citizens of Barcelona – and beyond. Can he possibly have been tuned into something more quantum when he developed the Catenary string models for his re-design of arches? Do we mirror the patterns that are now being described as string theory and fractals, when we work in a state of “flow”? …if a Catalan stair has to be constructed it is not detailed by the planners or architects. Instead, the masons on site hang a rope between the point of departure and the point to be reached, trace the shape and flip the curve over to use as the guide for constructing the masonry arch that carries the stairs. The rope is in pure tension, as it can not take any compression due to its flexibility. Therefore the form it finds contains the pure tensile force within the envelope of the string. 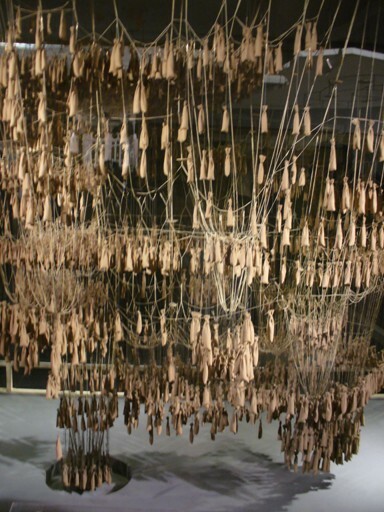 A design technique created by Antonio Gaudi allows an architect to design complex structures based on Catenary systems, whose curves are formed by perfectly flexible, uniformly dense strings suspended from their endpoints and weighted under gravity. He created many amazing structures with pieces of string that architects would be at a loss to reproduce using today’s most advanced design tools. Antonio Gaudi developed the system of catenary string statics into a spatial design system. He constructed scaled models of his design ideas by developing forms through a weighted string form-finding method. In his case, the models are spatial and are much more complex then the catenary staircase example. Gaudi achieved the desired forms through the control of three variables – anchor points of the strings, the length of the strings, and the weights attached to them. By designing his forms this way, Gaudi knew that the resulting geometry would act purely in compression when inverted. He also had a pretty precise estimate of the loads necessary on the different members of his construction. Beyond structural form finding, Gaudi also used this method for rendering the interior and exterior shapes of the buildings. He imagined them by painting and tracing over the “wire frame” models of lines in photos. As the photo above illustrates, Gaudi used a very tactile, haptic (no-mind, mushin) approach to achieve this innovation. He made this model with little weight bags, and string covered in pork fat! Within a week – mice ate most of his original model. This entry was posted on Wednesday, January 30th, 2019 at 18:41	and is filed under For Peace. You can follow any responses to this entry through the RSS 2.0 feed.